The first time that we tried to check out this restaurant, they were unexpectedly closed on a Sunday. Fortunately, the next time that we visited again, it was open. 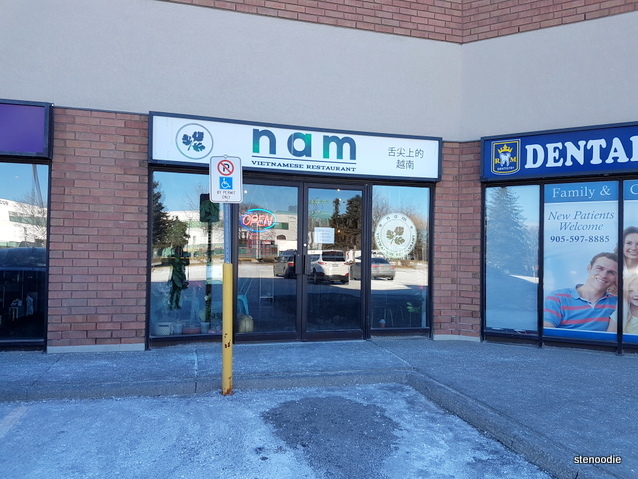 Nam Vietnamese Restaurant is a Vietnamese restaurant with elements of Cambodia and Vietnam located on the corner of Leslie Street and 16th Avenue in Richmond Hill (it’s right beside the newly expanded Fresh Burger). 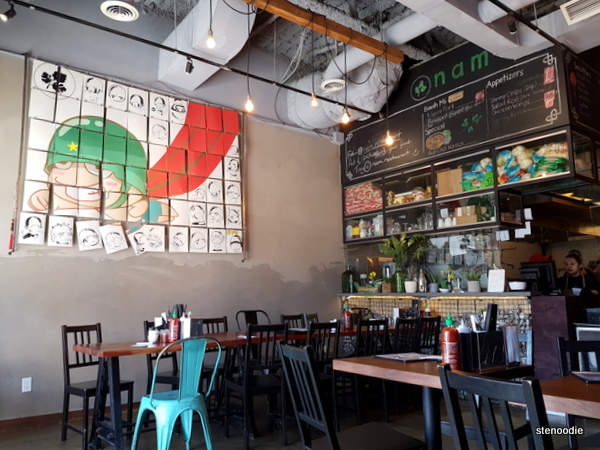 I really liked the colourful decor and design of Nam Vietnamese Restaurant. 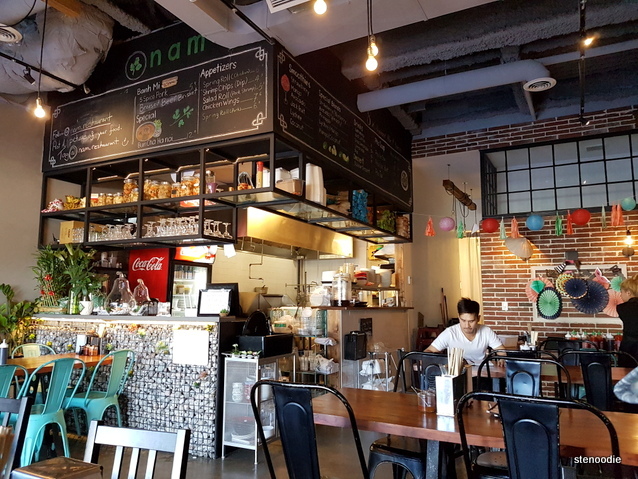 It was a modern looking restaurant that had naturey elements. 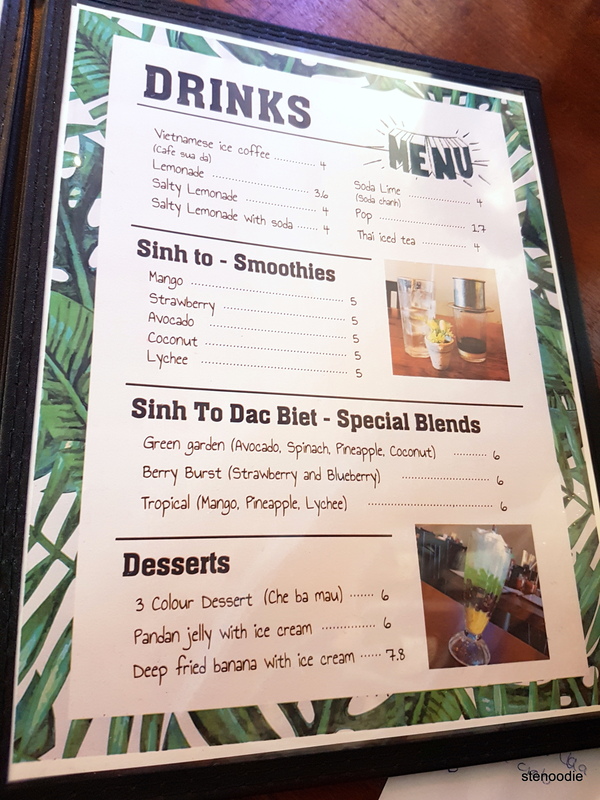 I think the staff there were of Vietnamese ethnicity as well. I loved their interior design!! 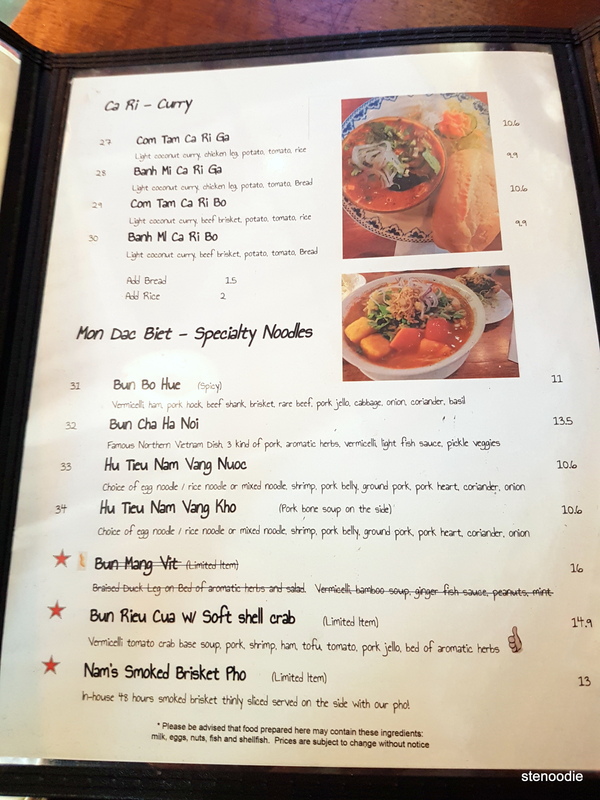 My mom and I ordered a large bowl of beef noodle pho containing all the works (rare beef, brisket, tripe, tendon, and beef balls) in a beef broth braised for 8 hours, curry chicken with baguette, and an order of Nam’s dry crispy chicken wings with lime sauce. The food arrived in a reasonable time. There was free wifi in the restaurant. Loved the taste of this curry!! 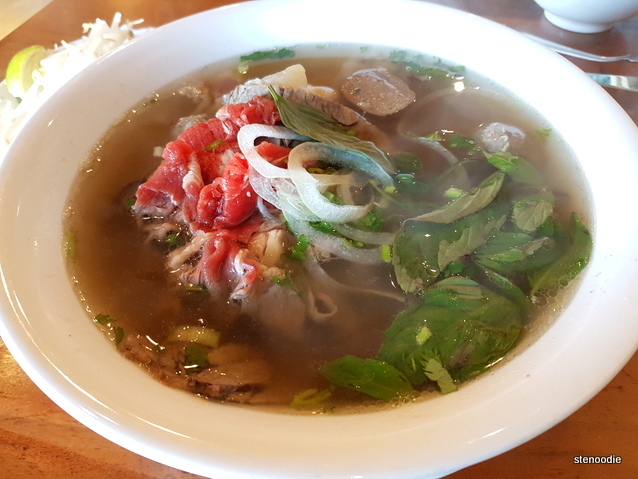 The large bowl of beef pho (pho dac biet) soon arrived. The large size was indeed large and I liked how the broth was steaming hot and almost boiling when it arrived at the table. 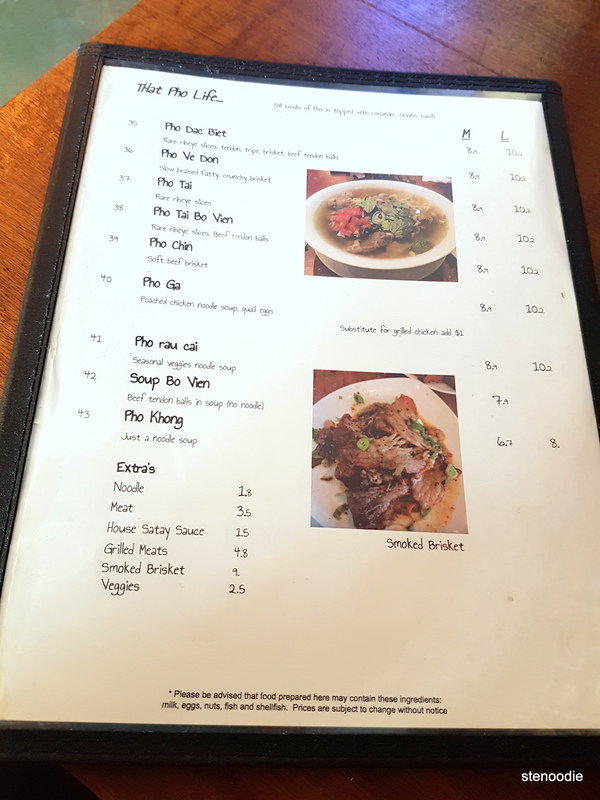 There were a lot of meat in it (rare beef, brisket, tripe, tendon, beef balls) and the pho noodles were the thin ones. It tasted really good. I especially liked how the rare beef arrived raw and actually red in colour. 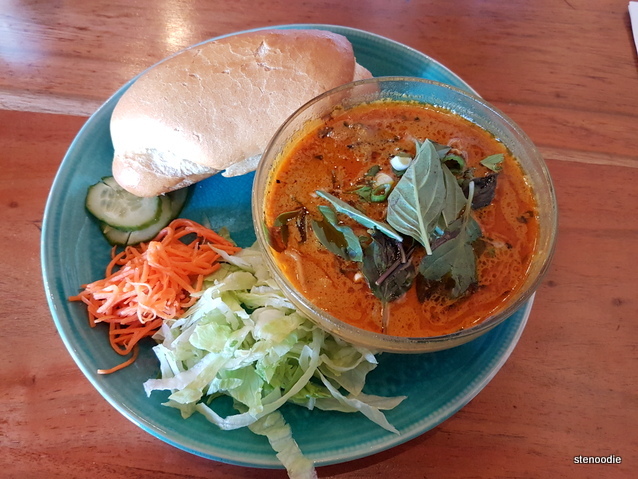 When you dipped it into the steaming hot soup, it quickly cooked in the soup. It was so tender and delicious. I especially liked the beef tendon — the pieces were large and so soft and melted in your mouth when you ate it. 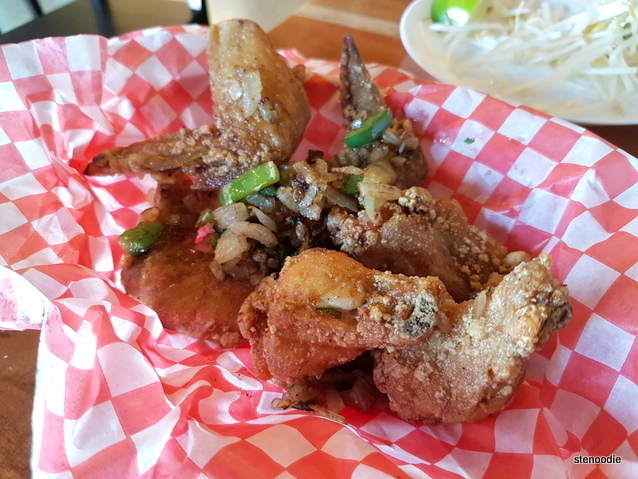 The order of Nam’s dry crispy chicken wings with lime sauce (canh ga chien) was a little disappointing. There were only 7 chicken wings in the basket. For a price of $7.90, my mom thought the price was not justified. I was disappointed with the taste of the chicken wings. I thought they could have been more flavourful. Perhaps I should try the chicken wings with their special house sauce next time. 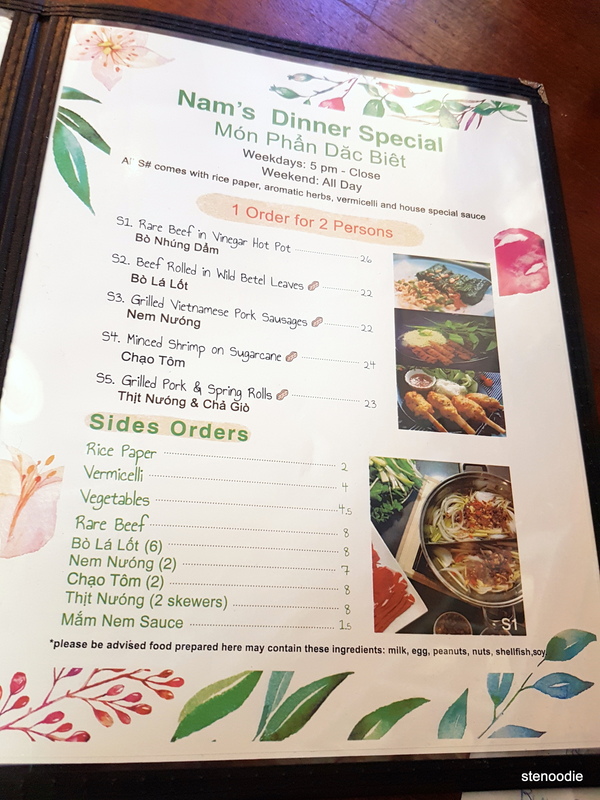 March 9, 2019: I returned back to this restaurant for some authentic Viet eats! In between the first blogged visit and this one, I had actually tried to come back another time but that visit saw a long wait for a table that I didn’t end up waiting. Thus, I knew that the key to securing a table at this busy and popular restaurant was to arrive early. They open at 11 a.m. and so right after our Zumba class, we arrived at 11:15 a.m. and nabbed one of the two remaining two-seater tables. Had we arrived another ten minutes later, we would have had to wait for a table. 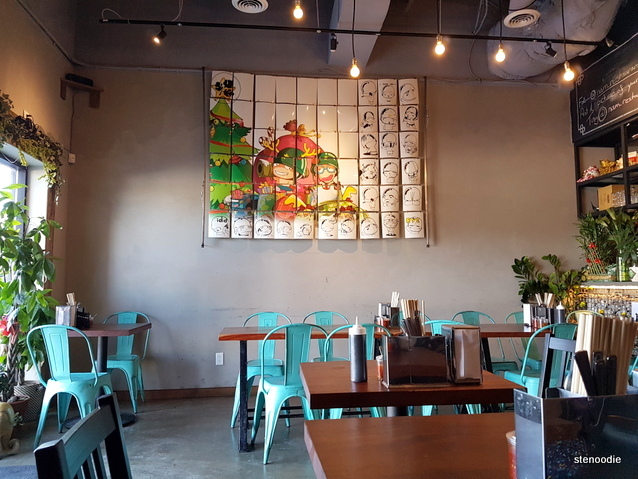 This restaurant is really popular (and they don’t have many tables and even fewer tables for a party of two — when there are larger parties, the smaller tables are pushed together for the larger parties). 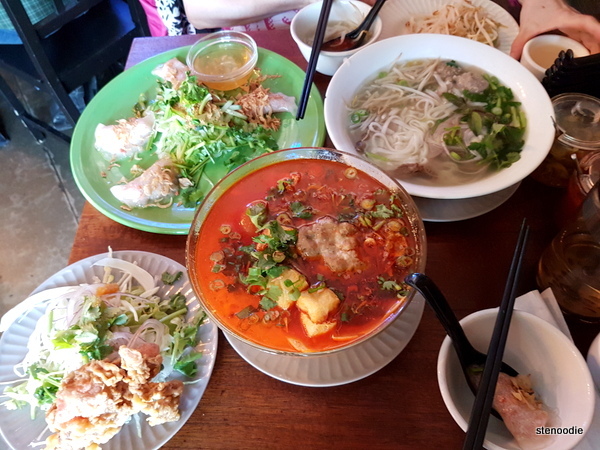 On this visit, we ordered the limited quantity Bun Rieu Cua with Soft Shell Crab, Pho Dac Biet, and Banh Bot Loc. It didn’t take long for the items to arrive and we had to strategically place the dishes to fit on our small table. 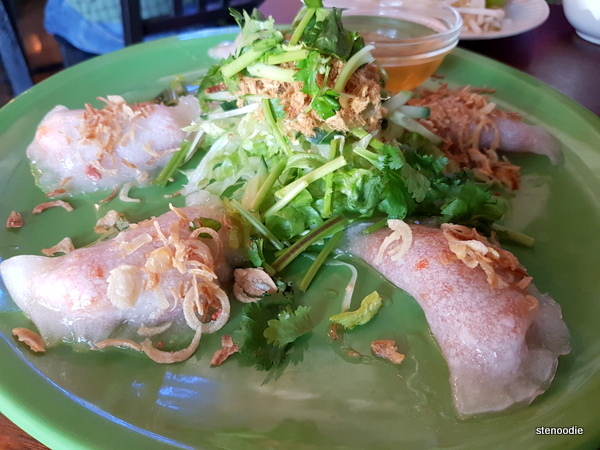 The Banh Bot Loc was an appetizer of shrimp and pork clear chewy dumplings. This wasn’t something I’ve had before (at least I don’t think so). I was initially surprised to see only five dumplings on the plate. The dumplings were arranged delicately with a pile of lettuce and cilantro in the middle of the plate. There was a dish of fish sauce too on the side. The shrimp and pork clear dumplings were pretty good and the skin of the dumpling was indeed chewy. It’s not the cheapest appetizer though since the quantity is so minimal. 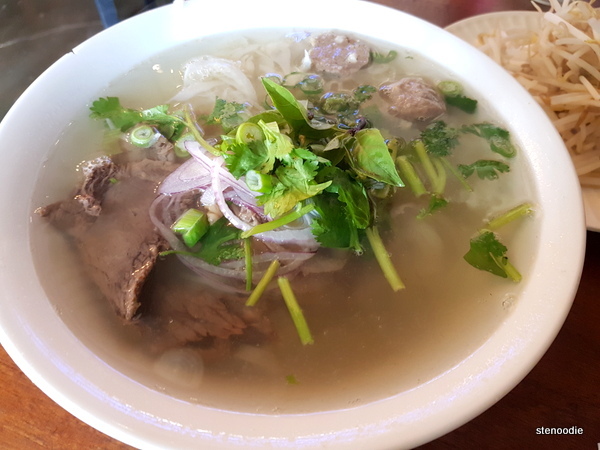 The Pho Dac Biet is a bowl of your classic pho: Beef broth soup, rice noodles (you could choose between the fresh or dry noodles), and the meats: Rare ribeye slices, tendon, tripe, brisket, and beef tendon balls. 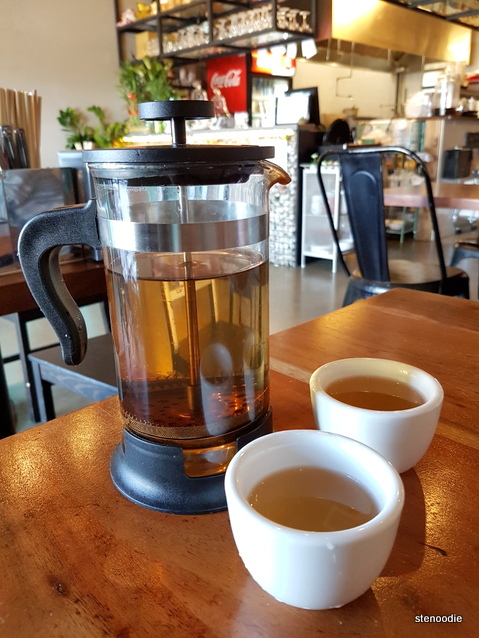 I really liked the clear beef broth that was just savory and umami enough for my taste. 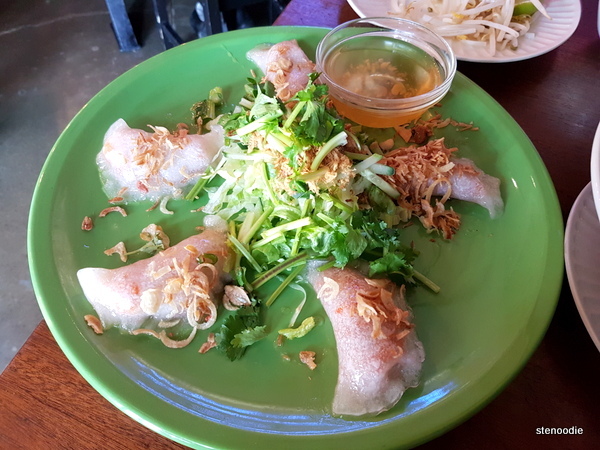 The fresh rice noodles were very tasty and with a good texture too. 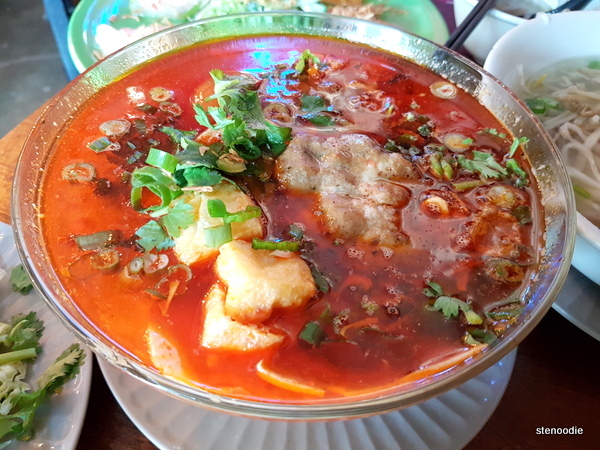 My mom enjoyed the tender tripe but preferred that the broth could have been hotter in order to cook the accompanying pre-cooked bean sprouts more thoroughly. 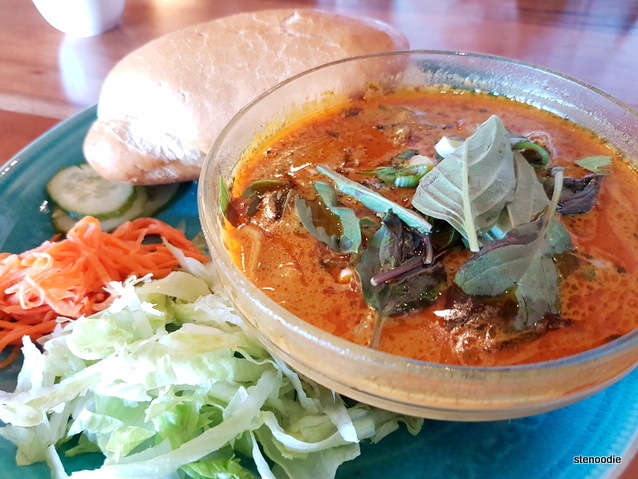 The Bun Rieu Cua with Soft Shell Crab was part of the specialty noodles on the menu and this is definitely an item that I’ve never tried at a Vietnamese restaurant before. 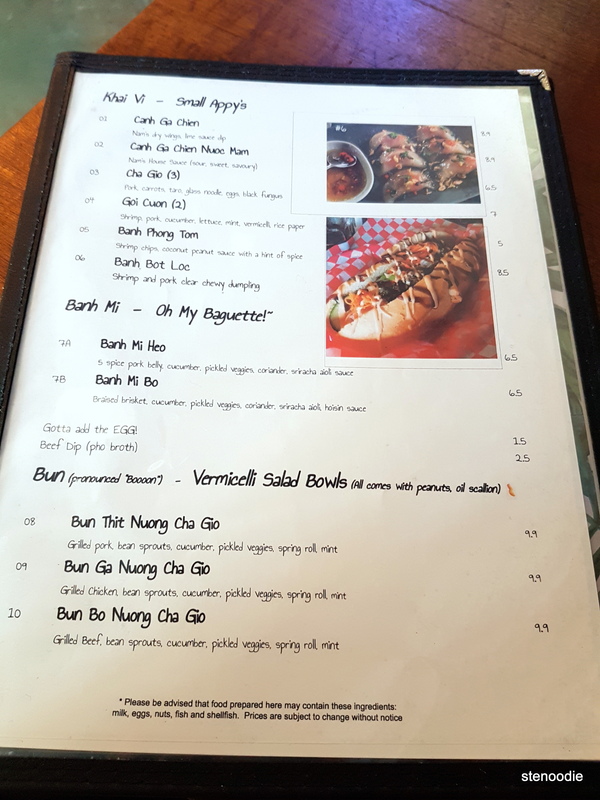 This was an order where there was a bowl of vermicelli in conjunction with a plate of the deep fried soft shell crab. 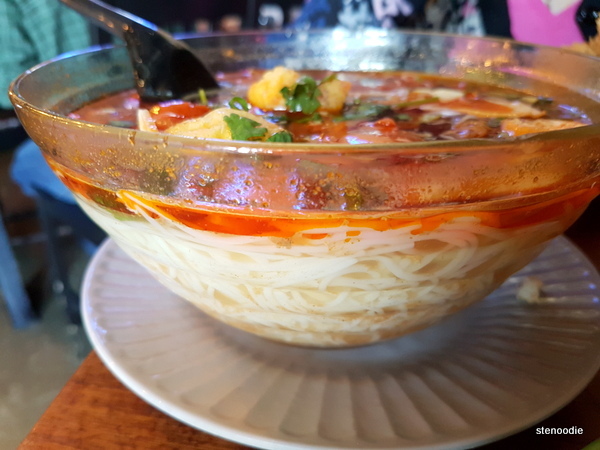 The vermicelli was contained in a transparent bowl of tomato crab base soup with pork, shrimp, ham, tofu, tomato, pork jello, with a bed of aromatic herbs. This was definitely a top-notch specialty noodle and I highly recommend it for the limited quantity aspect. The soup base was delicious and kept hot during the whole meal due to the oils on top of the soup (which retained the heat for the bowl). 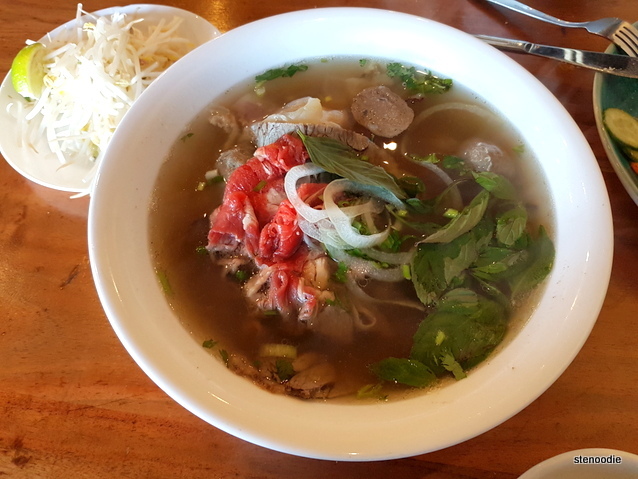 The vermicelli was thin and a good complement to the soup base. There was a big chunk of crab meat in the soup too which gave a strong crab flavour. There were so many ingredients in this bowl of noodles! 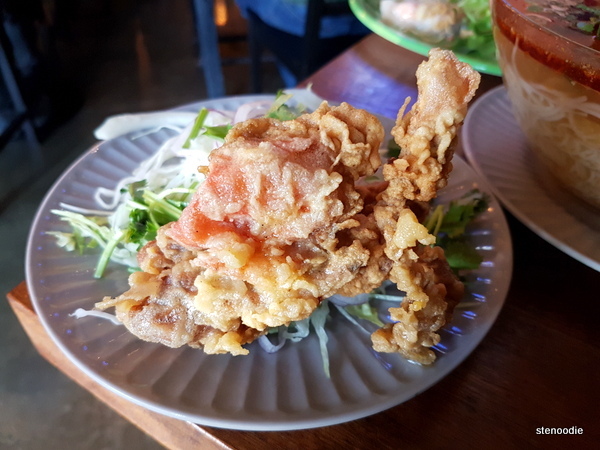 The deep fried soft shell crab was a full crab which was itself worth the price alone. This was such a great dish! 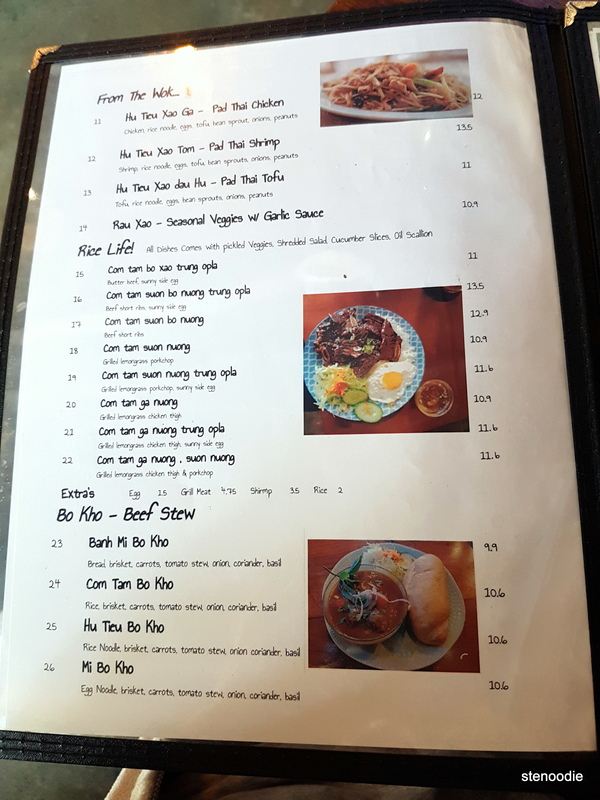 They have so many other unique dishes on the menu that I would love to try. Just remember to arrive early to avoid having to wait for a table. 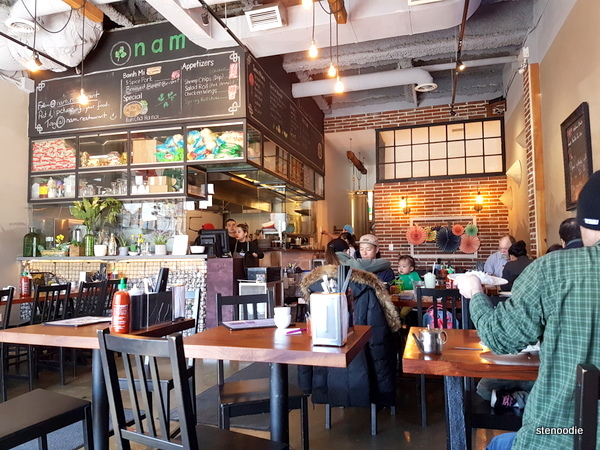 This entry was posted in Food and tagged 9206 Leslie St, Authentic Vietnamese restaurants, Banh Bot Loc, banh mi ca ri ga, beef pho, Bun Rieu Cua with Soft Shell Crab, canh ga chien, Curry Chicken with Baguette, food blog, foodie, good pho in Richmond Hill, Nam Vietnamese food reviews, Nam Vietnamese Restaurant, Nam Vietnamese Restaurant menu and prices, Nam Vietnamese Restaurant pho, Nam Vietnamese Restaurant Richmond Hill, Nam's dry crispy chicken wings with lime sauce, pho, pho dac biet, restaurant review, Richmond Hill, tomato pho with crab meat, tomato pho with soft shell crab, Vietnamese. Bookmark the permalink.